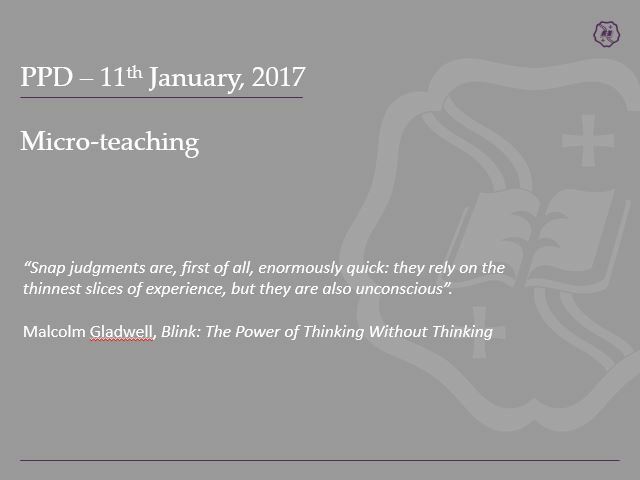 Micro-teaching is a teacher training and faculty development technique whereby the teacher reviews a recording of a teaching session, in order to get constructive feedback from peers (or analyse their own performance) about what has worked and what improvements can be made to teaching technique. It enables us to reflect on how we are perceived in the classroom. How do we stand? Do we stay in the same spot? Do we pause before accepting to answers to questions? Do we ignore certain parts of the classroom? Making even the most marginal of gains can really improve your teaching effectiveness and, as Professor Dylan Wiliam puts it, Every teacher needs to improve, not because they are not good enough, but because they can be even better. Click on the link to open the presentation. 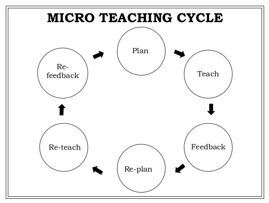 Click on the link to open the Micro Teaching self reflection form.